At our last meeting we had time to discuss any issues Brethren wished to raise. Several topics were discussed, but the key one for the evening was ‘why do people join Freemasonry’. 1) The importance of male kinship as a source of social relationship motivates people to come to Freemasonry because of their desire for community, connectedness, and companionship with like-minded people. 2) Men come to Freemasonry rarely because they accept and believe the principles of the order in the first instance, but because of the lack of social ties in the local community making them hungry for substance and cultural tradition. 3) Freemasons are characteristically charitable at heart, they help others in need including their neighbours, not necessarily because doctrine tells them they must, but rather because they want to serve their communities. 4) Members willingly re-enact age-old rituals as a part of their individual journey of self-development, because they want to be part of a group that shares the same values and morals and the sense of shared experience with people of similar beliefs. 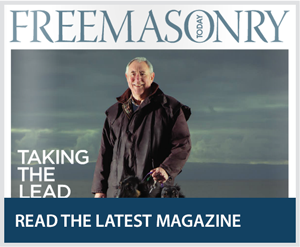 5) Freemasonry therefore becomes a source of shared meaning within a society that seems to have been stripped bare of ceremony and depth of social relationships, replaced by the fast paced ‘share everything immediately without commitment’. This way of living has replacing eyeball conversations of a real nature that have depth and meaning which is something that Freemasonry provides.